In August of 2016, I came out with the first six notebooks in the Inky Fingers line with the new designs. They came in two sizes each of Currently Inked Log, Blank, and Lined. While the paper quality was fantastic on these, there were some production issues; and I ended up having to list a good chunk of them (between 50-75%) as factory seconds. Since then, I’ve been trying to find a printer able to do the quality of work I was looking for. I tracked down a great commercial printer but discovered that the Wheat Straw paper I had been using is no longer being manufactured. This unexpected development caused a significant delay in updating the line. Fortunately, my new printer was able to track down some of the remaining stock of the paper from the mill, and about a month ago, we went to press. Two days ago, 48 cartons (!) of notebooks were dropped off in my living room. While I am in desperate need of more closet space, I am super excited to announce the long-awaited update to the Inky Fingers notebook line! So, before I introduce you to the new notebooks in the family, a few words about the general changes that have been made. 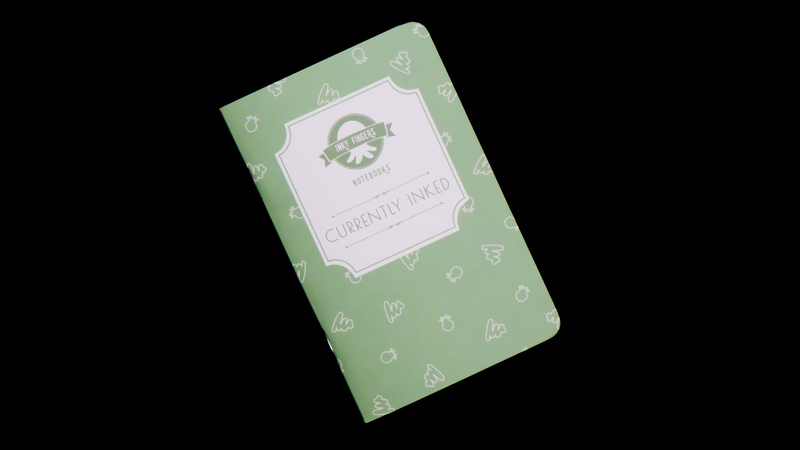 The quality of the cover has been upgraded on all the new notebooks in this batch. I’ve opted for a lovely, satiny matte cover rather than the glossy cover used previously, and have gone with a thicker and stiffer card stock. The new notebooks were done on a very high-quality digital press, and the image quality is significantly improved time around. I was able to source more wheat straw paper from the manufacturer, but this paper is not exactly the same as the paper used in the earlier run. This new paper is slightly smoother, but still offers excellent performance against feathering and bleed. It is also a bit thicker, reducing the level of ghosting. Overall manufacturing quality is much higher on this run. Issues with poorly-cut corners and improperly-folded notebooks have been eliminated this time around. The interiors of the books are crisper and sharper, and the exteriors are smoother and more colorful. One of the very first notebooks to go out of stock from the initial run was the Currently Inked Log in both Traveller’s and Pocket sizes. So, of course, more of these were required. The changes to this customer favorite were minor. The color of the notebook cover was adjusted slightly to get closer to the arts & crafts color scheme I had originally envisioned for the line. 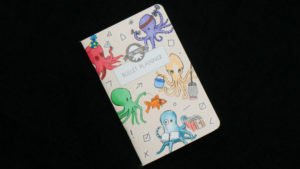 The squiggles and images of Inky the Octopus scattered about the cover were thickened up a bit to make them stand out. And the interior graphics were cleaned up just a little bit. Aside from that, everything else stayed the same. The notebook still features 44 pages of ink slots (132 for pocket and 176 for traveller’s). 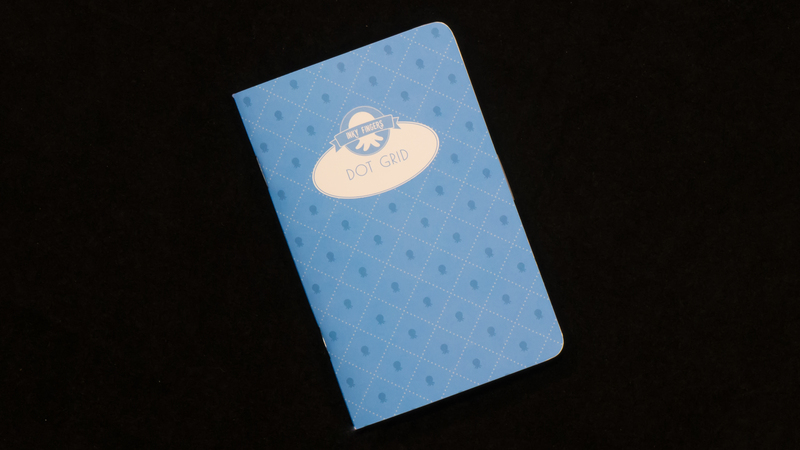 Due to popular demand, I have added a new dot grid notebook to our line. It comes in both pocket and traveller’s sizes, and also features 44 numbered pages. Like most dot grid notebooks, this one features a 5mm grid. I designed the dots in this notebook to be very faint. They’re light grey and rather small in size. (It makes photographing the interior very difficult, actually.) So, if you’re the kind of dot grid user who likes the dots to sort of disappear after you’ve filled out the page, you’ll likely really appreciate the dots in this notebook. 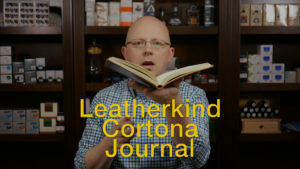 I’m going to do a full-blown video on the Bullet Planner in the near future, but this notebook was inspired the amazingly popular Bullet Journaling technique. I love some of the BuJo concepts but have personally found the time to draw out individual pages prohibitive. I know BuJo is all about flexibility and customization, but I have found that I need a little extra structure. In those 52 pages, you’ll get a numbered index, future log, monthly log, monthly tasks, daily logs, collection pages, and some blank dot grid pages at the end. I find that this particular notebook is a really quick and easy way to dabble in planning or tracking your day without having to adopt a more complex system. These bullet planners are being sold individually, or in one-year packs (6 pocket notebooks, 4 traveller’s notebooks.) The one-year packs are being sold at a discounted rate. What about lined, blank, and factory seconds? Of the first run of Inky Fingers notebooks, the lined sold moderately well, and the blank sold quite poorly. I’ve still got a decent number of lined notebooks available (with the old-style glossy covers), and a whole bunch of blank notebooks available, so I didn’t bother getting those reprinted with this batch. As for the factory seconds that have been for sale on the Pen Habit website, the items that are listed currently on the website will be it for a while. New factory seconds may become available in the future as I start to package up existing product for sale and find individual items with some cosmetic flaws. I WANT THEM! WHERE DO I GET THEM? 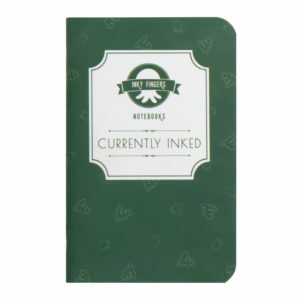 The best place to get your Inky Fingers notebooks is right here. Just visit http://penhabit.com/shop. You can also get downloadable templates for the Currently Inked notebooks. I will be making the Bullet Planner templates available for sale as well, and will likely be putting up free templates for lined or graph notebooks as well as time permits. Inky Fingers notebooks will also be available through a few retailers worldwide, including Vanness1938.com, PocketNotebooks.co.uk, and LaCouronneDuComte.nl. These retailers may not have the new notebooks yet, so you’ll want to check. I’m also reaching out to some other retailers as well in hopes that they’ll pick up the line.